War Memorial Hospital's Long Term Care's (LTC) 51 beds are located within the hospital providing ready access to our high quality care. LTC specializes in providing skilled nursing care on a 24 hour basis through the coordination of an excellent team of Nurses, Nurse Aides and other highly trained support staff. Physical Therapy plays a large part in helping residents either return home or maintain their highest quality of life while staying with us in the facility. In addition to Physical therapy, Occupational and Speech therapy services are available to residents as directed by their physician. 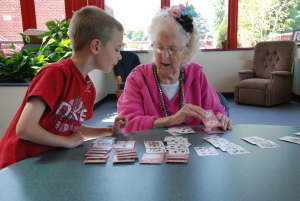 Recreational activities are available daily for residents. Beauty/Barber shop services are onsite as are physician and vision services. Whether a resident is visiting our LTC for short-term rehabilitation following surgery or illness, or will make LTC their home, you can feel comfortable knowing they will be well cared for by a skilled and compassionate team. For more information or questions about admission, please contact our Director of Social Services. Every LTC bed is dually certified to accept Medicare and Medicaid as payment providers. The facility also accepts private pay residents.